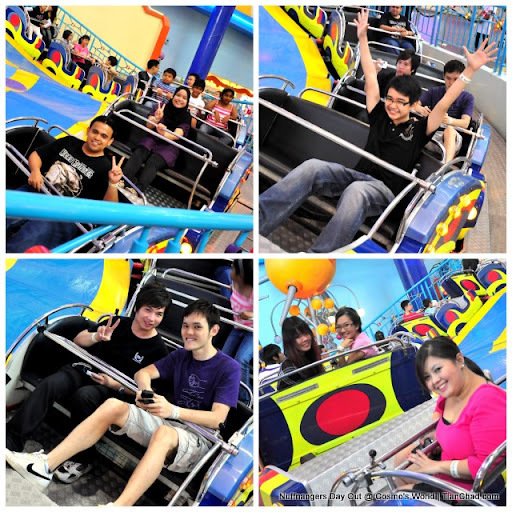 On the 9th of October 2010, a group of Nuffnangers including existing Glitterati Plus members gathered together to have a fun day out @ Berjaya TimeSquare Theme Park [Previously known as Cosmo's World Theme Park]. The male bloggers. Who is at the left? Nuffies that was there with us are Fresh@Xinxian and Karen Mayer~! Do you guys know the differences between "Nuffnangers" and "Nuffies" ?? Nuffnangers - Bloggers like me who is a member of Nuffnang and serving the ads. Nuffies - The hardworking people who works in Nuffnang. Some of us took the first ride called Ooort's Express. This is the fresh look before the ride start moving. The ride was so fast,dizzy and at the same time very long too. The person who is lighter is advised to sit at the inner side. Unless you wanna being squash by the heavier one lol. Now I myself took the rides and they are on the same ride. I try to record a video but not that successful. The ride was too fast! Then me and VinTsen took this 360 Degree ride call Space Attack. I like this one because you won't feel dizzy, just gravity changes =) Thanks Nicole for the photo. It looks like Guardian organized an event there. The new cute fluffy dolls is available on Guardian again! Chipmunks, Donald duck, Mickey Mouse, Pooh and Tigger. Which one do you like? This ride were meant for family members and their kid. Because it is super slow and small car. Yeah we took this Supersonic Odyssey roller coaster for twice. Vince, Tallboyz and Ruby took the ride too~! It was awesome where you can see how high you are from the floor and do a few 360 turns. One of the main attraction in TimeSquare Theme Park. Came to the Bumper Car rides for kid and it is funny to see different kids at one place. Some just wanna drive safely to avoid crashing. But some just want to bump your car. But amazingly kids are still kids, they can forget about it once the ride are finish. They don't go to argue with the others like what adults like to do. I am sure you met someone like that, who harbor bitter resentment. Look at the brightside come on! Nobody want to stick with sad aura peeps. She is one of the blogger who got tons of stuff to learn from. First met @ LG Blog Launch but didn't know that was her. At first I find it a bit hard to understand her blog post because it is like short form of Malay Language combined with English. But now get used to it already ar, if I don't understand I just ask lol. Through the Twitter know that today (19th Oct) is RedDaddy's birthday wor. Happy birthday! Here is the last ride we took, the DNA Mixer that can mixed up your DNA with others to become another gender. Just kidding. See all the long hairs flying, lol~! Managed to drag Vin Tsen to have this DNA Mixer ride before we leave! Last but not least, another group photo before some of us leave earlier. Michelle and Carlos, Nuffie from Philippines were there too. Thanks Joshua @ Tallboyz for bringing us to have this awesome delicious Soya Bean Rice Ball @ Lowyat Plaza. Got different kind of fills and I guess Chocolate tasted the best =) Will definitely visit there next time! Yesh I wanna do Bungy jump again~! PS: Can I get you comment and click 5 loves votes for My Selangor Story blog post (All links are available above)~? I do appreciate for your support ya! Will definitely do more giveaway for your support! Come come plan one day go sunway Lagoon for more extreme ride~! Haha I tak mau tulis cepat punya but banyak blogger mao ambil gambar so I just write it first. Ic m you guy have a lot fun lol . wow it seems so fun~!! I pernah naik buaian kat situ,takut....kecut perut I.